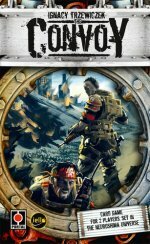 In recent years the Polish publishing house PORTAL has made itself a name on the international games market, and it was the post-apocalyptic world of NEUROSHIMA and the associated gaming products which had been a foundation of PORTAL's success. Starting with role-play games and the extraordinary successful tactical boardgame Neuroshima Hex, the product line had been extended by the independent resource-management cardgame 51st State and its successor The New Era. However, the popularity of the whole scenario seems to be unbroken, and so PORTAL will return to the SPIEL '12 with yet another independent spin-off cardgame called The Convoy. As author Ignacy Trewiczek acknowledges in the credits of the rulebook, the creation of this game had been inspired by Mark Chaplin's cardgame Revolver which was released last year, and indeed there are some superficial similarities between both games since the players are facing each other equipped with asymmetric composed card-decks, and each of the players is trying to fulfil his own task. 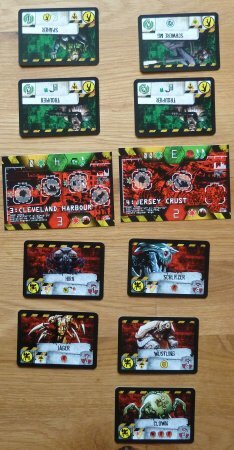 In The Convoy one player takes the lead of a horde of killing machines from the Moloch-factory which are on a mission to destroy the remains of New York, humanity's last stand. The other player assumes command of the human army of the Outpost, and it is his aim to stop the convoy of the machines before they can conquer New York. The playing area which is used to implement this scenario consists of a total of five City cards which are placed in line between the players. The fifth and last city in this line is New York, and during the course of the game the forces of the players will face each other in a series of encounters in the different districts of these cities, and the stepwise destruction of city districts and whole cities slowly will take the robot machines of Moloch towards their final destination. Each round of play ends with the players fighting over one undestroyed district of a still intact city which is furthest away from New York, and the outcome of this skirmish will be determined by the players comparing the total strength of the cards which they have placed at this city. Regardless of the outcome - this particular city district will be destroyed when the skirmish is over. However, a victory of Moloch means that one additional district also can be marked as destroyed, meaning that the deadly convoy is moving even faster towards New York. A victory of the Outpost on the other hand means that the Moloch-player loses cards from his deck, and since the deck will not be reshuffled with the discards during the course of the game a stepwise loss of cards may lead to the Moloch running out of supplies before reaching New York (and thus losing the game). As indicated earlier, the positions of both players are highly affected by the composition of each playing deck, and so the Moloch-deck contains fighting-units in form of Robots and Modules which can be attached to the Robots on order to enhance their abilities. The Outpost-deck on the other hand consists of Outpost-soldiers and buildings, and whilst both kinds of cards may affect the results of a battle they can be distinguished by the fact that buildings cannot be moved to a different city once they have been brought into play. Finally, both player decks contain some Instant cards, and these cards can be used to trigger certain one-time events like the movement of units from one district to another. Before the results of a skirmish are determined on the end of a round, the players first have the possibility to bring new cards into play and to use the special abilities of the cards which they have in play. Here the Moloch-player always is first to play, giving him the advantage of choosing the district which is contested this round, but resulting in the Outpost-player being last to play before the battle takes place. The special abilities of the cards of both players are manifold, and the use of such an ability may result in the movement of units, the killing of units, the gaining of special strength markers, the triggering of certain city effects etc. Some of these abilities can be used anytime, whereas others only apply in the moment when a unit enters a city, and so the players are challenged to find the correct timing when to play a card. Indeed, a good sense for timing is absolutely necessary, because the abilities of the different cards in each player's deck allow for a very high degree of card interaction. Playing new cards and triggering card abilities in a well-planned order gives the players a possibility to enjoy a dramatic choreography, and so the players need to stay alert for possibilities which might arise during the game. Quite interestingly, it is at this point where The Convoy is getting similar to Neuroshima Hex, because the combination of strategic placement of a player's units and the use of special abilities bears a certain resemblance of the rather tactical challenge found in Neuroshima Hex. The players are looking to force costly decisions upon their opponents, and at the same time each player faces the dilemma that certain card abilities only can be triggered if they are paid by discarding cards from the player's hand. As indicated, all discards normally cannot be reclaimed, and so each of these payments slowly diminishes the player's remaining supplies. 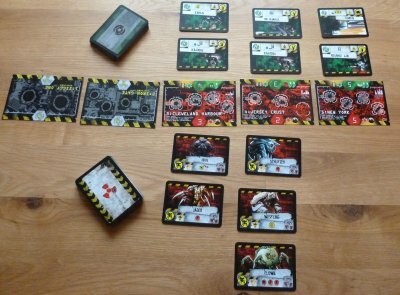 All of this can be found in a similar form in Neuroshima Hex, but the possibility for card interaction and chain effects is much greater in The Convoy. In addition, The Convoy features many additional mechanisms which reflect the whole background story, and so the Outpost-player may call upon the inhabitants of each city in order to ensure their assistance, and furthermore the destruction of each district may lead to different special events which may be enjoyed by the winner of a skirmish. Once again it is surprising to see that Ignacy Trewiczek does not just run PORTAL as a publishing house, but he actually succeeds in creating one or more interesting games every year. The Convoy once again is deeply rooted in PORTAL's world of Neuroshima, but its free-standing playing mechanisms make it independent of all other games in this line. The tactical challenge found in the game is quite demanding, especially since the players slowly need to discover the possibilities offered by the cards in their deck. However, something which is usual for this type of game also can be expected from the Convoy, and this is the fact that the players - once a few games have been played - will start to consider the composition of their deck when deciding their next moves, and they may possible wait for specific cards to appear. At this point the game wins yet another level of playing depth, and so the overall good impression of the tactical gameplay is supplemented by an interesting element of speculation.